The Hottest Radio Station, playing the best ‘DJ Mixed Music’ In the World! Giving listeners a variety of today’s and yesterday’s hits, bringing y0u non-stop, feel good, party music, 24/7. 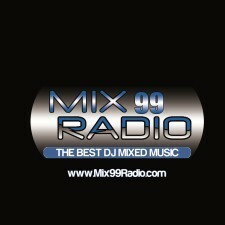 Streaming world-wide at www.Mix99Radio.com (available for Iphone, Droid & Blackberry mobile devices). Also check out www.OldSchool99.com (80’s&90’s Hip Hop) and www.Caliente99.com for our Latin Listeners. Get all Three stations Free on our Mobile App or on “Tune In Radio” App.